The VitraHaus is the newest addition to the Vitra Campus in Weil am Rhein, Germany. Designed by the Swiss architect firm of Herzog & de Meuron, the VitraHaus is primarily conceived as an exhibition space for the Vitra Home Collection. In 2004 Vitra launched the Vitra Home Collection. Intended as a central marketing platform for Vitra's extensive collection of domestic furniture the Vitra Home Collection was also intended to clearly define the border between Vitra's domestic activities and their office furniture/general contract activities. Combing designer furniture classics by the likes of Charles and Ray Eames, Verner Panton or George Nelson with the work of young, modern designers such as Jasper Morrison, Hella Jongerius or Erwan and Ronan Bouroullec, the Vitra Home Collection remained true to Charles Eames' collage style of home furnishing: A mix of carefully chosen products in different styles creates the best balance in the home. Initially the Vitra Home Collection was displayed in part of a former factory building on the main Vitra production site. In 2006, however, Vitra commissioned the Basel based architect studio Herzog & de Meuron to create a more appropriate building in which to permanently house the Vitra Home Collection. The result is the VitraHaus. In addition to housing the Vitra Home Collection, the VitraHaus is also the latest addition to the so-called Vitra Campus, a collection of buildings by internationally renowned designers and architects. The VitraHaus is the first new building on the Vitra Campus since the completion of Zaha Hadid's Fire Station and Tadao Ando's Conference Pavilion in 1993. 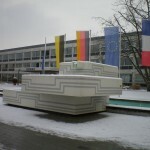 The VitraHaus structure is based on a classic house design; albeit a classic house design that appears to have been achieved by extrusion and pressing rather than more traditional building techniques. In total the VitraHaus is comprised of 12 individual houses; the individual units are not only stacked upon one another, but also intersect and support each other. The decision to use a typical house design stemmed principally from the consideration that the Vitra home collection should be displayed in a home environment, and not in a cold, impersonal warehouse. This homely effect is achieved not only through the outer appearance of the building, with its simple gable roofs, but also through the use of familiar, residential proportions and dimensions in the interior spaces - in effect maintaining so called domestic scale. 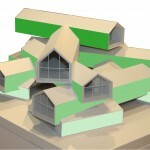 The decision to stack the houses on top of one another was made in order to both keep the footprint of the building as small as possible, as well as to create a vertical structure which creates an overview - or better put three overviews: the surrounding landscape, the Vitra production facilities and the Vitra Home Collection. 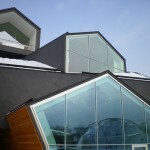 An important feature of the VitraHaus is the glassed end gables; a feature which gives the house two personalities. By day the surrounding countryside appears to be drawn into the interior and to become almost a part of the decoration; in contrast, however, at night when illuminated from within the black outer walls merge with the night sky and the VitraHaus projects out into the night air, and becomes part of the local environment. 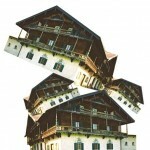 The effect is of numerous houses floating above and next to one another. The VitraHaus has not been universally welcomed in Weil am Rhein. Situated on the edge of the town, next to the vineyards and at the foot of the Tüllinger Hill, the principle complaints concern the shape of the building as well as the decision to paint the outside of the building anthracite. 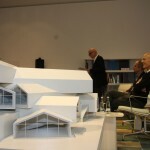 According to local newspaper reports, during a local council meeting in November 2009, SPD councillor Jürgen Valley called the VitraHaus a provocation and claimed that ...it doesn't fit in with the surroundings. Architect Jacques Herzog, naturally, sees the situation somewhat differently. For him the project was a chance to get away from development driven architecture and a rare opportunity to complete an author driven project. For Herzog, through the stacking and interlacing you not only create a multitude of new forms and architectural spaces but achieve a wonderful paradox: a simple, familiar house design which appears complex on account of the numerous intersections. This perceived complexity is further enhanced by the combination of the external orthogonal-polygonal form and the more organic internal form which results, principally, from the spiral staircases and occasional open spaces and small side windows. Vitra defend the colour choice as being an important part of the design: principally the black exterior allows the effect of floating houses by allowing the structure to merge with the darkness. In addition the anthracite of the VitraHaus contrasts with the brilliant white of Frank Gehry's neighbouring Vitra Design Museum. With the VitraHaus Key visitors can build wishlists and send them per email to VitraHaus partner smow for an individual sales offer. Every visitor to the VitraHaus receives a personal VitraHaus key. With this chip card visitors can access product details, information on the designers and the official list price for the displayed articles via the terminals that are positioned in every room. From these terminals the visitors can then build their own wishlist which they can then email to themselves - or whoever should buy the items for them. When the VitraHaus key is used for the first time the keycard stores the visitor's country of residence and preferred language and so, regardless from which room the digital catalogue is accessed, the information is always in the correct format for the visitor and so allows visitors to easily expand and/or change their wishlist as they proceed through the VitraHaus. On the second floor of the VitraHaus a La Chaise Armchair by Charles and Ray Eames has been set up in front of a small camera; allowing visitors to take a photo of themselves in one of the true classics of 20th century American furniture design. The photo is also stored on the personal VitraHaus keycard and can be emailed as a small memento of the visit. Created by Hella Jongerius the Vitra Colour Laboratory is a space within the VitraHaus in which visitors can experiment with and better understand colour and colour combinations. Lengths of fabric and pieces of plastic in various tones and shades are employed to help visitors better understand how colours react next to one another and how the material type can affect the way we perceive a colour. For Vitra Chairman Rolf Fehlbaum the Vitra Colour Laboratory should help visitors make better informed decisions about how they furnish their homes and help them to be more confident in their use of colour.